From the top of the rock climbing wall, I squinted down at the deck 43 feet below and gulped. How much more nervous would I have been had I realized I was actually more than 200 feet in the air with the open ocean below me. But as I struggled to grip the plastic handholds and pull myself up, I barely remembered I was on the top deck of a cruise ship out in the Atlantic. The Freedom of the Seas makes older cruise ships seem like floating motels rather than self-contained vacation destinations. As Royal Caribbean’s newest ship, the Freedom seeks to offer entertainment and activity options for every possible taste. And after spending two nights onboard, I heartily agree that it has succeeded. With everything from surfing to miniature golf, an ice skating rink, a boxing ring, 10 restaurants, and 16 bars and lounges, only the grouchiest of passengers could fail to have fun. I dread days at sea. If I spend too much time in the sun, I get sunburned and dehydrated. And I can only survive so many rounds of trivia and kitschy poolside games. But on the Freedom, I struggled to get through all the activities on my list in one full day. Royal Caribbean’s biggest coup is the ship’s one-of-a-kind onboard surfing pool called the Flowrider. Kids and adults lined up to test their balance on a bodyboard; some managed to pull off impressive rolls and no-hands tricks, but almost everyone ultimately wiped out with pizzazz. Stadium seating surrounds the Flowrider, and I spent several hours cheering and laughing at the boarders. It’s better than reality TV and just as addictive. On the same deck, guests can enjoy miniature golf, a golf simulator, a basketball court, and the aforementioned rock-climbing wall (Royal Caribbean’s biggest yet). For indoor entertainment, the ship provides an ice skating rink and a humongous fitness center, complete with a boxing ring, cardio equipment with personal flat-screen TVs, and separate areas for spinning and Pilates classes. The state-of-the-art facility could lure even the most dedicated sun worshippers into exercising, but with only one day onboard, I managed to evade its charms. Three separate outdoor pools provide a spot for everyone. 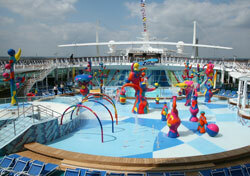 The main pool area has both swimming pools and hot tubs and several levels of sun decks. An adults-only solarium has a private pool and two cantilevered whirlpools suspended out over the ocean. The kids’ H20 Zone features a watery playground, pools, and hot tubs catering to the younger crowd. I was fully prepared to shed my professional demeanor and run crazily through the water sprays but was stopped only by the frigid temperature of the water. But it doesn’t stop there. Extensive kids and teen lounges offer hangouts for the under-18s only (not that it stopped one guest in a business suit from blasting video opponents with a plastic gun). Family karaoke, teen discos, and a teen DJing class will banish any adolescent sulking. The Royal Promenade, which is longer than a football field, is home to several shops, as well as the occasional parade. I also poked my head into an incomprehensible art auction in one lounge and browsed in the extensive library collection. And of course, the spa and its male counterpart, the barbershop, will provide true pampering if you can snag an appointment. The activity options are nearly endless, but your wallet may not be. With the notable exceptions of spa and barbershop appointments and shopping, most activities are included in your cruise fare. So you can surf and rock climb all day long to your heart’s content. But if the ship’s photographer is on hand, you may find yourself handing over your cruise card to purchase evidence of your athletic prowess. Despite the lure of new comfy bedding and in-room flat screen TVs, I never managed to get to sleep on the Freedom of the Seas before 2 a.m. And I’m the type who’s usually out cold at 11 p.m.
Cruise ship evenings always start with dinner, which is more event than meal. Guests can choose to eat in the three-story main dining room with its grand stairway or the casual pool-deck cafe for free. Or, for a flat $20 fee, dine at the Italian and steakhouse specialty restaurants. A late-night pizzeria and the teen-fave Johnny Rockets round out the options. Rushing to your next activity? No problem. Our waiter gave us cheesecake to go when we had to make an early exit from dinner. All ships have production shows, and from the one I saw, Royal Caribbean is giving its competition a run for its money in this department, too. The “Once Upon a Time” revue presented various fairy tales with flashy dancing, inspired sets and costumes, and well-known rock and Broadway songs (think “Hungry Like the Wolf” for Little Red Riding Hood and “Hair” for Rapunzel). I planned on staying 10 minutes and sat rapt for an hour. I also caught the ice skating performance; the ship was rocking but the skaters still managed to complete difficult jumps and spins. Cruisers looking for a little audience participation can indulge their inner American Idol in the Studio B karaoke bar. Or for a little more anonymity, join the adult singalong led by the wacky Matt Yee. Be forewarned; if you don’t sing and dance with appropriate vigor, he will stop and admonish you. The Crypt is a goth-themed two-tiered nightclub where many cruisers dance into the wee hours of the morning. The Olive or Twist bar in the Viking Crown Lounge is the place to sip a martini and listen to jazz. For a drink and a chat, guests can choose from a champagne bar, a wine bar, an English pub, and other lounges throughout the ship. Most of the bars close between 1 and 3 a.m., and the Crypt is reportedly open until “late.” If you plan on burning the midnight oil, remember that drinks are not free on this ship and shore excursions may depart bright and early the following morning. A plethora of activities day and night is my dream-cruise-come-true. The problem is sharing them with thousands of other passengers. That’s right; as the largest cruise ship now afloat, the Freedom of the Seas can hold 3,634 guests at double occupancy or 4,376 guests at total occupancy. For the most part, I was surprised there weren’t more lines. The longest lines I saw were to sign the release waiver for the Flowrider and to get a table at Johnny Rockets. The wait to climb the rock wall or take a turn surfing weren’t too bad, partly because it’s so much fun to watch everyone else until it’s your turn. The ice skating rink and show lounge filled up fast, so I recommend arriving early to get a choice seat. The circus parade down the Royal Promenade was mobbed, and I had trouble finding a good vantage point when I showed up five minutes before the start time. Plenty of deck chairs were available at all times, but the prime poolside spots filled quickly. I hardly ever saw free lounge chairs in the smaller adults-only solarium. The whirlpools filled up but weren’t overcrowded, and I never had a long wait for a tropical drink. Embarkation and disembarkation were both chaotic, but the Cape Liberty Cruise Port where I got on will not be the homeport of the Freedom. Hopefully, the larger Miami port is more used to crowds and getting on and off the ship won’t be a problem. The ship has yet to try out its tender system with thousands of passengers trying to get to shore at the same time. Transferring guests from a ship at anchor might be another situation where the large number of passengers affects the smooth operation of the cruise. The general sense I got is at times when multiple activities are offered, you won’t notice the crowds so much because passengers will disperse throughout the ship. However, when half the ship’s guests want to do the same thing at the same time—such as eat or see the show—crowds may become a problem. Royal Caribbean has produced a ship that truly offers something for everyone. The ship caters to families, both with its extensive kid-friendly activities and with accommodations that take into account family needs, such as the Presidential Suite, which sleeps 14. Active couples will also enjoy the extensive offerings and can easily find adults-only areas if they prefer to escape the family environment. Some seniors may find the ship too big and busy; corridors are extensive in a ship that’s longer than the Chrysler Building is tall. If you’re looking for an intimate experience, this ship isn’t it. But if you want to fit as many experiences into a seven-night vacation as possible, then the Freedom of the Seas might be your answer. Just be prepared to share those experiences with your 3,500 new neighbors. Who knows? Perhaps the antics of the other cruisers will provide some of the funniest or most memorable parts of your trip.